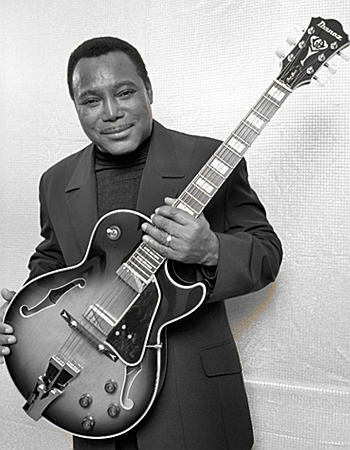 George Benson discusses his album "Guitar Man"
Benson has been hard at work on a new studio album, "Guitar Man", which was released October 4 via Concord/Monster, and he recently took the time to tell us about it. One of the first things electric I ever saw was a guitar. I was living in a house with no electricity until at 7 we moved to a house that had it. It had electric lights but the previous owners had even taken the light bulbs with them when they moved. My stepfather had an electric guitar. He went to his pawn store one day to get a guitar and an amp, and I couldn't understand what I was hearing. All afternoon, I just sat against the amp and let it reverberate through me. Something must have stuck. You have a treat coming. I haven't cut an album like this in years, where they allowed me to come to the studio and record off the cuff and just try things out. Recording with Harvey Mason, Joe Sample and Ben Williams added a tremendous amount to this record. We didn't have a very big budget with this record, we just had ideas. We recorded a three-hour block and I expected ot get about three songs out of it, but everything went so well we ended up finishing seven. We didn't really have to re-do many of the songs. It was highly improvisational, it was very exciting. We made this record the way we used to make them. When I was coming up, there was Grant Green. It's a mixture, people like Django Reinhardt and Hank Garland, who was an amazing technician who swung real hard. My early records were more that style. You've worked with an incredible array of talented people. Who is someone you would really like to collaborate with in the future? Oh man, there's a lot of them. I haven't done anything with Chick Corea. He had a group called Return to Forever, and everyone in the group became a superstar. I would really like to work with him. We were the ones that put Ibanez on the map. In 1977, they came to me and I said, “You know what? You make really great guitars but you don't have any originals.” They were making quality stuff but they were just copying other people's guitars. They asked me if I had any ideas and so I gave them some. Now they are the No. 2 guitar manufacturer in the world. We are getting ready to release two guitars pretty soon: the LGB, or the Little Georgie Benson, and the Breezin' guitar off of my Breezin' album. They are both very beautiful. My GB10 I have with me all the time. Then there are other GB models, because I've had seven models throughout the years, and these two new ones bring it up to nine. There's nothing I've asked Ibanez to do that they won't do. We've experimented quite a bit. My whole thing is to make something people can use, and not waste any time or resources. The amazing thing about the GB10 is that it's probably the best acoustic performing guitar. You can drop it on the floor and it won't even lose tune. I've done it. We took a Stevie Wonder tune and turned it inside out. We just completely re-invented it and added an acoustic bass on it. I can't wait for people to hear it. We also did a Beatles song, “I Want To Hold Your Hand,” that you will not believe. I can't wait for people to get this album.